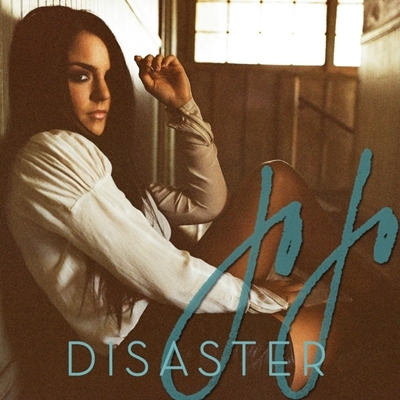 Diva Devotee: Single Review: JoJo "Disaster"
JoJo is back with first single, Disaster, from her third, upcoming 2012 album, Jumping Trains. Originally finding her biggest success as a teenager with début single Leave (Get Out) way back in 2004, the singer- songwriter has returned, out of her teens- though, only barely at 20- readying herself to make the difficult leap from teenage star to it's adult equivalent. What better way to do this then by adding a rock tinge to the music. Sure, it's clichéd and predicable, but if it works who cares. The question is, does it work for JoJo on Disaster? Yes and no, is the answer to that. JoJo does her best to bring fire, passion and emotion to this tale of relationship meltdown, offering a spirited and dexterous vocal that has exciting pacing and beautiful variations of tone and register that are sympathetic to the lyrics of the song. In other words, no problems here. The problems are to be found with tracks production, that crazily mirrors JoJo's fine and light tone with the faux-rock production way too closely. The consequence of this is that Disaster becomes sonically blurred at times, with the vocal and the backing fighting for the foreground- a place that should belong to JoJo's voice alone.Try as I might, messing with equalisers, volume, the bass settings and even listening through headphones, I frustratingly just couldn't get this song to sound balanced. Those problems aside, the production is also missing any semblance of a soul: sounding tinny and cold in its polished and manicured flatness. Even though this isn't a rock song and JoJo isn't trying to be the next Joan Jett, Disaster really needed an edge and authenticity that the use of live drums and strings, instead of their synthesised counterparts, would have brought. Disaster had all the requisites for a great rock-pop song-well written lyrics, an interesting melody and top notch vocals- to relaunch "adult" JoJo and the new album with, but it's really let down by Mario Marchetti's anaemic and overly-polished production. I think this is a great comeback for Jojo, it shows her growth in her music and vocals. Yes, this song does need a little more flair to it but I think its an awesome comeback track. I think this is great comeback, though I think that most of her vocals are overproduced but it shows her growth in music and her vocals. So this comeback is pretty good. I think because I'm not very aware of her past music, other than her first single, I can't really comment on her growth. However, I think I may go searching for it as I've heard good things about it! Thanks for the comment! Yea!!!! Jojo is back!!! And yes I think you should really check out her older stuff, for someone that young it was really good. I really liked Jojo's early songs like "Leave" and "A Little too Late." I'm at work and thus, can't listen to the track but if it's like you say it is that's too bad. Her voice is solid and can stand on it's own. I wonder what the rest of her album will soundlike? Thanks for the post. I have to say I'm pleasantly surprised with her vocal. What a great mix technique she has in the higher notes - a perfect pop voice. Ms K. Perry would do well to take notice! Jealous! I agree with you about the recording mix in the chorus though. As well as the instrumentation, the bvs an octave below are too loud (which I don't think are her, although I can't really be sure). I think they have tried to thicken the sound but they have somehow ended up obscuring her voice. Shame. Additionally I feel the track should be a little slower in speed to let it breathe a bit. I bet the speed will make this a nightmare for her to perform live, especially in the section from 1.55-2.30ish! I do too, won't be too long till we find out! You should also check out this performance http://www.youtube.com/watch?v=Fc-NxiNkdDY . This performance has the same speed I think? It does sound like it. She definitely sounds better live. This poor poor girl, took so long to come out with music a lot of people forgot about her so she doesn't get the benefit of being a new fresh artist and she doesn't have the benefit of having a loyal fan base. She really needs to come out with hot $hit for her music career to go anywhere.